Recipe provided with permission from Chef LaLa, certified nutritionist, chef and author of the top selling cookbook Latin Lover Lite. View more of Chef Lala’s great recipes and tips. 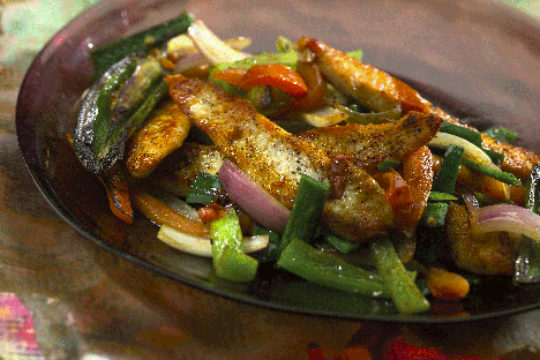 Enjoy a spicy south-of-the border taste with these chicken fajitas. Orange, lime and cilantro create a tangy taste to the meat. Peppers and onions give this dish some bite. This recipe also works great with beef and shrimp. Each recipe makes 6 servings. Slice chicken breasts into ½ inch slices. In medium bowl, combine olive oil, light soy sauce, orange juice, lime juice, cilantro, garlic, seasoned salt, pepper. Pour mixture over chicken; stir to fully coat. Cover, refrigerate and allow marinating for 2-4 hours. Heat canola oil in a large skillet over a high heat to achieve stir-fry effect. Drain excess marinade from chicken. Add chicken to skillet, sauté for 3 minutes until golden brown. Add red and green bell peppers, onion and jalapenos. Sprinkle soy sauce over vegetables, stir constantly. Vegetables should be cooked but still firm.